'Solar Gain' (Keith Keppel, R. 2008). Seedling #02-58A. IB, 24" (61 cm), Early midseason bloom. Standards and style arms darker than golden glow (M&P 9-L-6); falls darker than (9-L-5); beards darker than deep chrome yellow (9-L-7); glaciata. 'Delirium' X seedling #99-64A: ('Atomic Flame' x 'Lonely Hearts'). Keppel 2010. Honorable Mention 2012. 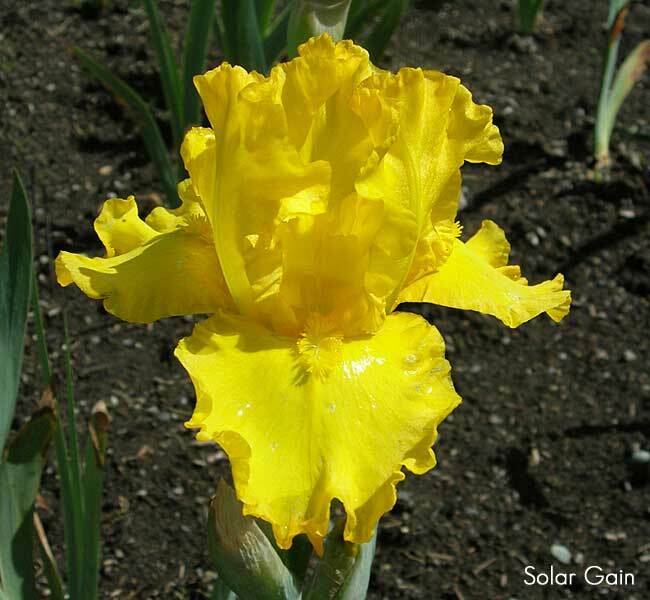 From Keith Keppel Iris catalog, 2009: SOLAR GAIN EM 24" (Delirium X (Atomic Flame x Lonely Hearts)) Get out the sunglasses! Intense uniformly dark gold glaciata. Fresh flowers on rare occasion show a very faint rose brown dart and marginal veining on standards only. (Get out the magnifying glass!) Strongly flared, heavily ruffled, and hot! #02-58A. $25.00; 3 for $60.00.